Lava flow is a surficial outpouring of molten rocks. The same name is also given to already solidified rock bodies that formed as molten or semi-molten flows of rocky material. Lava flows are the most common volcanic feature on Earth. They cover roughly 70% of the Earth and are also very common on other terrestrial planets, covering 90% of Venus and 50% of Mars5. 1. Red hot basaltic lava flow. Hawaii. 2. Blocky lava. La Palma. 3. Slowly solidifying pahoehoe lava flow. Hawaii. 4. Pillow lava. Iceland. 5. Transition from smooth pahoehoe to rubbly aa. Hawaii. 6. Columnar lava. Northern Ireland. Lava flows are very common features on planet Earth although the vast majority of them are hidden from us in the deep ocean basins. The lava type associated with submarine volcanism – pillow lava, is therefore underrepresented where ordinary people have a chance to see it. 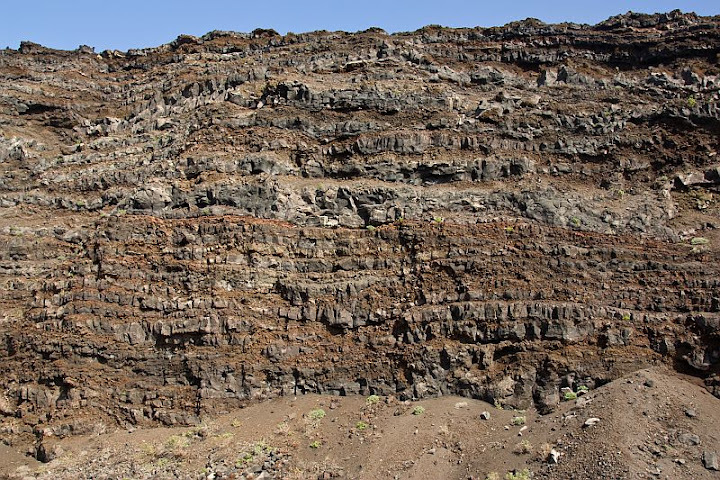 The most common way to divide lava flows into distinct types is following: Pahoehoe lava flow, Aa lava flow, Blocky lava flow, and also Pillow lava flow. Sometimes Turbulent lava flow is also added, but the latter is only of theoretical interest to scientist because we will not see that type of lava flow in the nature. Turbulent lava flows may have been present billions of years ago when the interior of the Earth and consequently lava flows as well were significantly hotter and the composition of lava was less siliceous. That enabled the lava to flow more easily and turbulently. The most common subaerial lava flows today are pahoehoe, aa, and blocky lavas. Lava surface is cooling very rapidly. The temperature of glowing lava is at least 475 °C. Bright yellow is hotter (over 1000 °C) and orange cooler (800…900 °C). Dull red colors indicates a temperature in the range of 600…700 °C. Lava surface may cool from bright yellow to dull red within minutes. Pu’u O’o vent, Kilauea volcano. 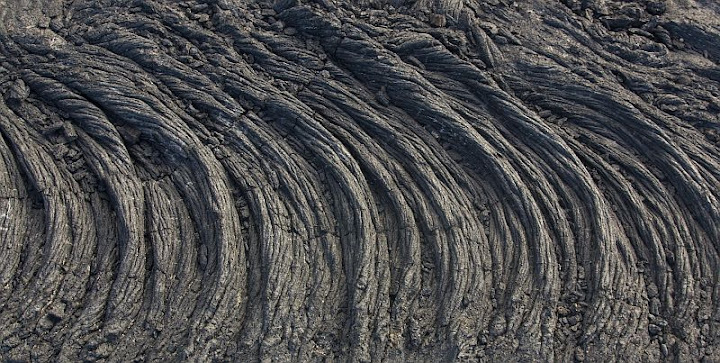 Pahoehoe is a smooth and continuous lava crust. Pahoehoe forms when the effusion rate is low and consequently the velocity of lava flow is slow2. Pahoehoe lava flow is usually at least 10 times slower than typical aa lava flow5. Higher effusion rate results in lava flow being shattered which is how the rubbly and clinkery aa lava surface forms. Pahoehoe and aa lava are strikingly different in appearance, but their composition may be identical or very similar. Lava flow that was originally pahoehoe may transform into aa lava but the reverse is impossible — once lava crust is broken it can not return back to smooth and continuous form3. Only low-viscosity (usually basaltic) lava can form pahoehoe. Aa lava is much more common and is not as picky about the composition of lava flow. Aa lava can be basaltic, andesitic, tephritic, etc. Blocky lava needs more felsic compositions (silica content generally over 55%). Blocky lava is composed of larger blocks than aa lava and these blocks have much smoother surface. Best known examples of pahoehoe lava flows are from the Big Island of Hawaii and the term ‘pahoehoe’ itself (just as ‘aa’) originates from the Hawaiian language. Pahoehoe is also known as ropy lava and it has several more varieties named entrail, festooned, filamented, sharkskin, shelly, etc4. Pahoehoe lava flows. Kilauea volcano, Pu’u O’o vent. Forming basaltic pahoehoe lava flow in Hawaii. Such lava flows move slowly and are not overly dangerous when compared with some other volcanic phenomena. However, their destructive power is practically unstoppable. You can easily walk away from a lava flow like that in most cases, but you will not be able to save your house if it happens to be on the way of such a slow-moving disaster. Here is all that is left of a house engulfed by a pahoehoe lava flow. Although it is possible to predict which regions are in danger of being covered by lava flows, people, if allowed, stubbornly continue to build their houses in these districts. Destruction that inevitably follows keeps the attention of public focused on these flows and provides money for scientists studying them. Hawaiian lava from the Kilauea volcano (Pu’u O’o vent). Lava flows are often imagined as fiery rivers of molten rock. That is indeed often the case, but it is also very common that there is no easily defined boundary of an active lava flow. The lava often flows largely underground. When I was hiking in Hawaii with a clear target in my mind to find an active lava flow I was perplexed and amazed when I suddenly discovered that I am actually standing right in the middle of such a flow. There were no river of lava. The red glowing material was just seeping out of the ground here and there, some in front of me and some already behind. This is potentially very dangerous situation not so much because of lava itself because it moves slowly and contrary to popular belief it is impossible to sink into it. But because of toxic volcanic gases that are involved with all types of lava flows. I tried to be very careful, trying to observe the flows so that the wind was blowing the gas away from me. Here is a picture of volcanic gas seeping out from the ground. If you are also trying to find flowing lava, always try to keep a safe distance with such a thick cocktail of hazardous gases and pay attention to the wind direction. Pahoehoe lava flows form a beautiful and otherworldly barren landscape in southern part of Hawai’i. Walking on a pahoehoe lava flow is relatively easy, especially when compared with walking on an aa-type lava flow which is practically impossible undertaking. However, hiking on a smooth lava surface is not without some nasty surprises. As mentioned earlier, lava crust solidifies quickly, but the interior keeps moving which often leaves empty space beneath the thin surface. It can easily break when you step on it which may result in badly scratched legs because the edges of a broken lava flow are razor sharp. Or even worse, you might have a broken leg which understandably is a major problem if you are miles away from nearest roads. Through practice hikers will learn relatively quickly where it is safer to step and where it pays to be extra careful. Generally speaking, smaller lava lobes are safer and larger gently sloping, but otherwise relatively smooth parts are the most dangerous ones. This image shows also that voids in lava flows are a common feature. Such a long tunnel-like caves are called lava tunnels. Large amount of lava can move through these tunnels which makes it easier for a volcano to grow itself laterally larger. This is a Thurston lava tunnel in Hawaii. Lava tunnels are especially common within silica-poor basaltic lavas. The formation process of basaltic ropy pahoehoe lava. 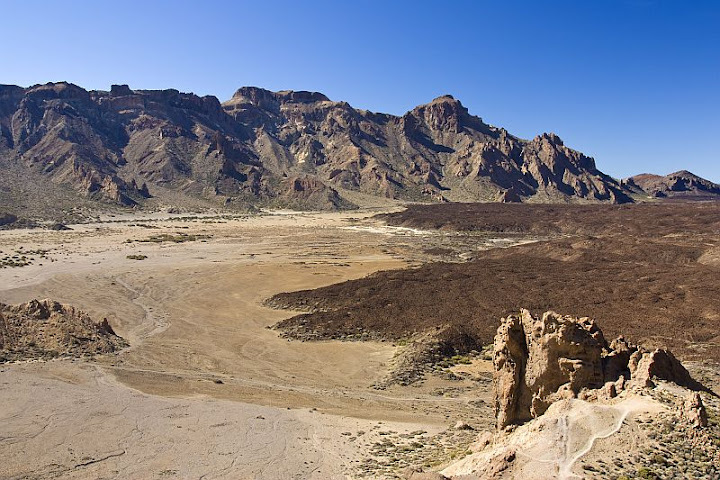 Coulée is a volcanic landform which is an intermadiate stage between lava dome and lava flow. The lava that forms coulée is too thick to flow like a normal lava flow. However, it may resemble huge pahoehoe flow (this coulée is more than 50 meters wide) when gravity forces it to flow downhill just a little and the slightly more easily flowing interior warps the surface just like it does in a ropy pahoehoe flow. Light-colored mound in the foreground is composed of pumiceous lapilli. Picture taken in Tenerife, Canary Islands. Aa lava is a rough rubbly crust of a lava flow. It is a major lava flow type. Other important subaerial lava flow types are pahoehoe and blocky lava. Aa and pahoehoe are terms that were brought to geological terminology from the Hawaiian language. Aa is according to native Hawaiians a sound one makes if he or she tries to walk barefoot on such a lava flow. There are different spelling versions, ‘a’a, a’a, a-aa are used as well as simple aa. Pahoehoe means in Hawaiian “on which one can walk”6. Walking on it is very slow and potentially dangerous even if one has good hiking boots. 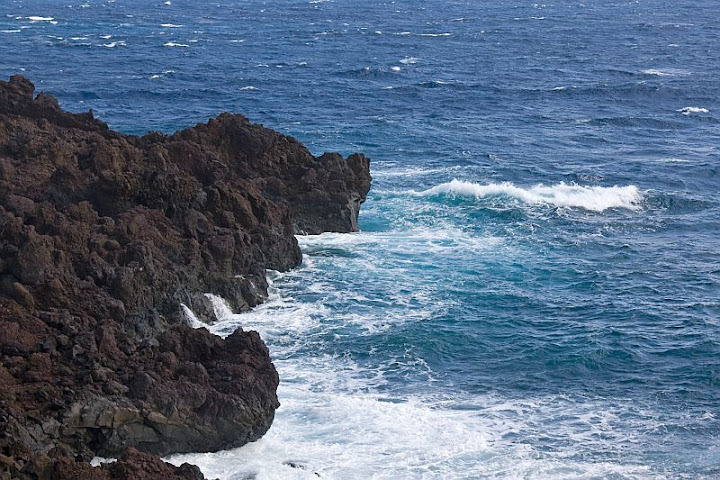 It is such a miserable experience because the uppermost part of aa lava is composed of loose clinkery unstable blocks. You can never be sure that the rocks you are stepping on do not move. They often do. This means that ground beneath your feet is unstable and you may easily lose balance. It is no good if that happens because the edges of fresh aa lava rubble may be very sharp. Sometimes aa lava blocks are so big that one has to climb over them. It makes moving progress very slow and bare hands will get scratched for sure. One thing that in my opinion is often poorly understood is the fact that aa and pahoehoe are terms that only describe the upper part of a lava flow. It is more correct to say that aa lava is a type of lava flow crust, not lava flow itself. Both aa lava and pahoehoe are usually massive beneath the crust which may be smooth (pahoehoe) or rubbly (aa). Massive part usually contains vesicles (gas bubbles) which will fill with secondary minerals like zeolites in older lava flows. This process takes considerable time and requires low-temperature hydrothermal alteration. There are no amygdules (vesicle filling mineral masses) in historic lava flows. Aa lava is more common than pahoehoe. Special conditions are needed for pahoehoe to form: lava with low viscosity (high temperature, low silica content), low effusion rate, and gentle slope. 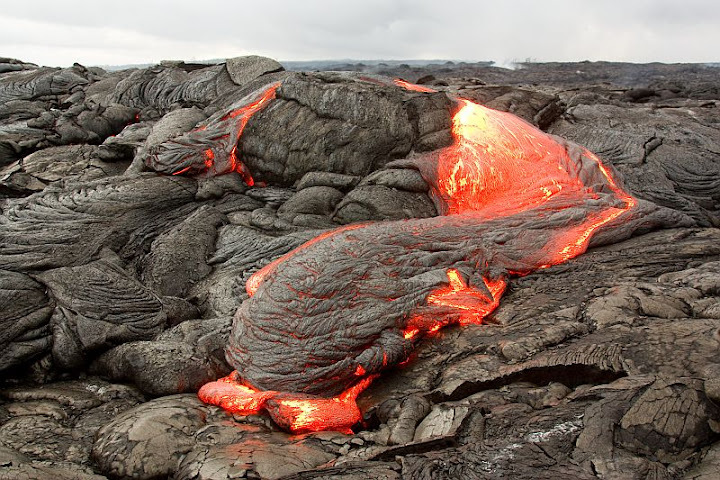 Aa lava is free of such restrictions and therefore forms instead of pahoehoe if the conditions are not right. It is usually the speed of advancing lava flow that determines whether aa or pahoehoe forms and that depends on the effusion rate and steepness of the slope. It has been shown that flow rates exceeding 5-10 m3/s clearly favors the formation of aa lava over pahoehoe on Hawaii3. Once aa lava is formed it never reverts back to smooth pahoehoe form. Here you can see both smooth pahoehoe and irregular aa lava types. Hawaii. This beautiful cascade of lava in Hawaii is largely composed of pahoehoe type lava flow, but in the left-hand side some lava tongues have broken to form aa instead of pahoehoe. Pahoehoe lava flow in the center that have partially covered the aa-type flow in Hawaii. 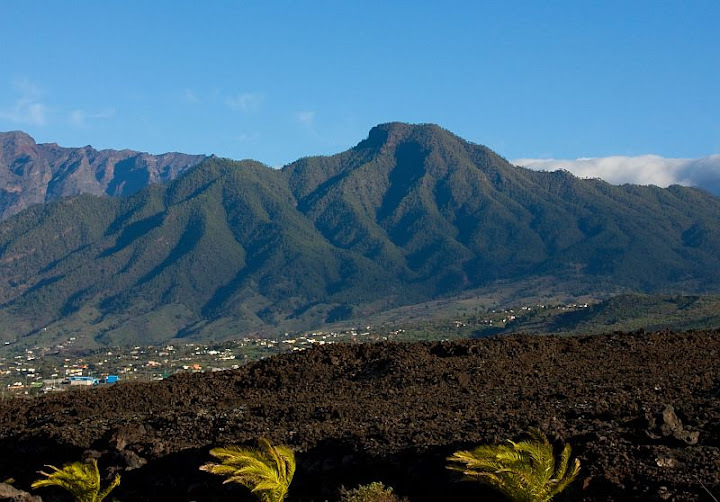 Lava flow formed in 1949 on La Palma in the foreground. It is almost completely aa lava. Pahoehoe forms only small part of it. Aa lava in the foreground near the western coast of La Palma, Canary Islands. This lava flow formed during the eruption of Cumbre Vieja in 1712. Aa lava and The Atlantic Ocean near the southern tip of La Palma. 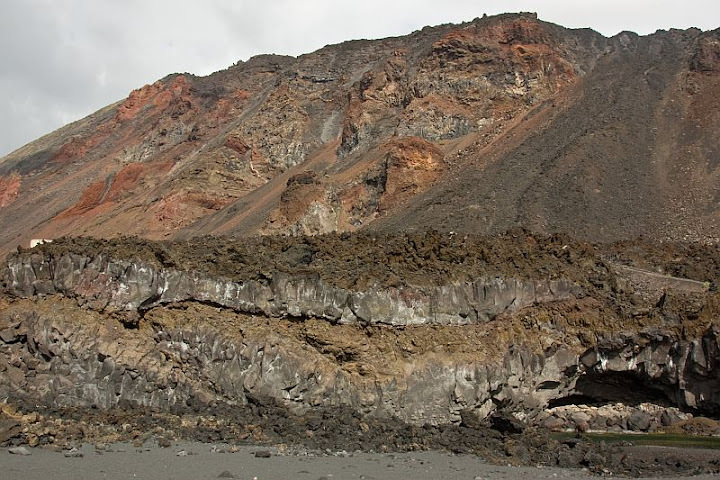 Here is a nice exposure near the southern tip of La Palma which shows the internal structure of aa lava. Here are two lava flows. Lower part of the flow is massive lava which has a rubbly surface. And on top of it is another aa lava flow. And here is whole mountainside in La Palma composed of many such lava flows. Aa lava on the floor of the Las Cañadas caldera in Tenerife, Canary Islands. The interior of a lava flow may be columnar because of thermal contraction. However, really beautiful regularly shaped columns like these form usually in a stationary well insulated lava lake not in an actively moving lava flow. Giant’s Causeway, Northern Ireland. Blocky flows are common if the silica content of lavas is higher (composition of basaltic andesite to rhyolite)5. Blocky lava flows resemble aa lavas. They also have highly irregular surfaces covered with debris, but they contain larger lava blocks with smoother sides and angular edges with common dimensions from few decimeters to several meters. Blocky flows grow higher as they advance and may reach more than 100 meters in height3. Here is a blocky flow (formed in 1712) from La Palma, Canary Islands. Blocks are angular and have much smoother sides than separate pieces of aa lava. Blocky flows may be tens of meters high. Nea Kameni island in the caldera of Santorini, Greece. Andesitic blocks. Nea Kameni, Santorini. Pillow lava is usually basaltic or andesitic in composition and always associated with water. Pillows are about one meter across each or smaller and form when lava flows out of the Earth’s crust underwater. Each pillow is like a bag that has quickly chilled margin which is filled with molten material. Pillow lavas are usually associated with mid-ocean ridge volcanism. The upper part of the oceanic crust is composed of countless number of lava pillows, but they can also form in much shallower conditions, even in lakes or under glacial ice. Some sources do not even mention pillow lava as a type of lava flow1. 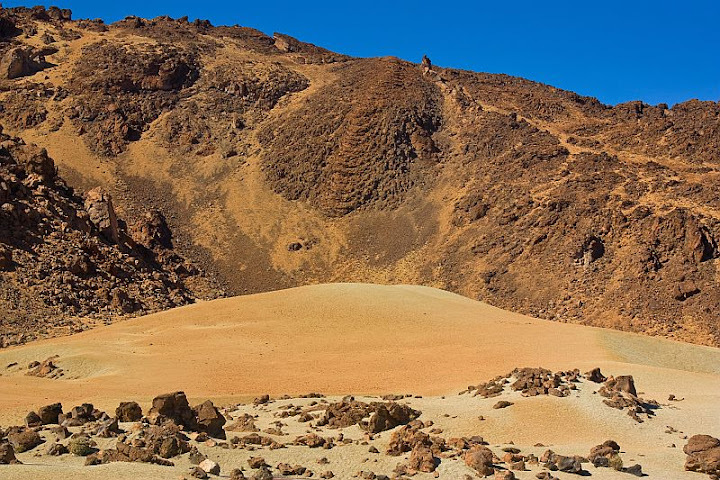 Possibly because lava flows are generally distinguished by their extreme elongation downslope. Pillow lava, however, is composed of many pillow-shaped outpourings, each one of them slightly elongated but not forming a continuous flow. Pillows usually demonstrate a convex upper and concave or flat lower surface. The surfaces are glassy because of very rapid cooling in contact with water. Pillow lava near Fasoula. Troodos Ophiolite Complex, Cyprus. Pillow lava in the Mathiatis open-pit mine. Troodos Ophiolite Complex, Cyprus. Pillow lava in the Mathiatis open-pit mine, Cyprus. Note radial cracks which are characteristic to pillow lavas and help them to be distinguished from spheroidal weathering which may create very similarly shaped rocks. These cracks are a result of cooling and are radial because they are perpendicular to the cooling front. 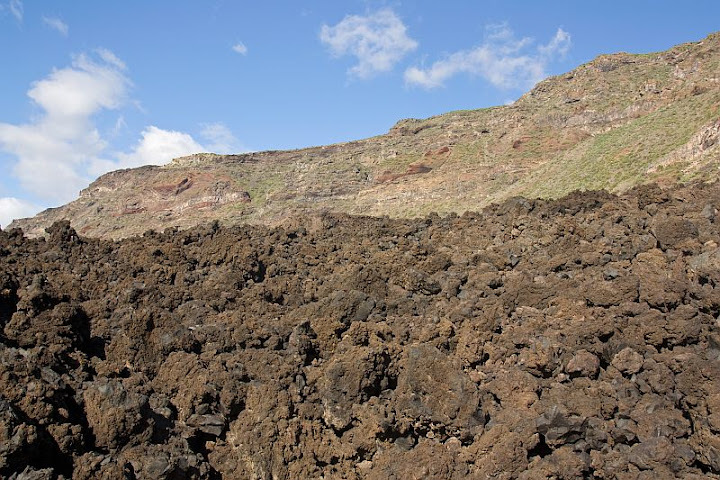 Pillow lava in the Caldera de Taburiente, La Palma, Canary Islands. Pillow lava in Iceland. Note the convex upper and concave or flat lower surfaces. You can find more images of pillow lava from the Troodos Ophiolite Complex here: Pillow lava in Cyprus. 1. Sigurdsson, H., (Ed.). (1999). Encyclopedia of Volcanoes . Academic Press. 2. Walker, George P. L. (1999). Basaltic Volcanoes and Volcanic Systems. In: Encyclopedia of Volcanoes (Ed. Sigurdsson, H.). Academic Press. 283-289. 3. Francis, P. & Oppenheimer, C. (2003). Volcanoes , 2nd Edition. Oxford University Press. 4. Jackson, J. A. (1997). Glossary of Geology , 4th Edition. American Geological Institute. 5. Kilburn, Christopher R. J. (1999). Lava Flows and Flow Fields. In: Encyclopedia of Volcanoes (Ed. Sigurdsson, H.). Academic Press. 291-305. 6. Schmincke, Hans-Ulrich (2005). Volcanism . Springer. It’s so nice to see you posting again. I have always enjoyed your writings and do miss them. Thanks for the informative post. Thanks, Ann! I am sure I will start posting more often now. I have several interesting trips planned (including USA) in the near future and lots of posts about rock types which I planned to write long time ago. Thanks, Francis. I’ll try to give my best.